How to Survive a Killer Séance by Penny Warner, a Mysterious Review. 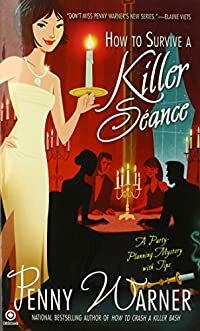 Review: Event planner Presley Parker's mother Veronica arranges for her to plan a special themed party at San Jose's famous — and reportedly haunted — Winchester Mystery House, but someone has other plans in mind for the spirits How to Survive a Killer Séance, the third mystery in this series by Penny Warner. Stephen Ellington, Veronica's new friend at the retirement community where she lives, thinks that a séance a perfect opportunity to showcase his son Jonathan's new technological wonder, a device capable of displaying a realistic hologram. And he believes the perfect venue for the event is the Winchester Mystery House, where they can "resurrect" the spirit of the mansion's eccentric builder, Sarah Winchester. Presley agrees to take on the job … especially since the building where she has her office has just been condemned and she needs the money to move somewhere else. All goes well in the planning, with 30 or so guests attending the séance on the appointed day. Sarah Winchester comes to life, as it were, but instead of just amazing the attendees with her life-like appearance — which she does — she also makes an announcement: "Jonathan, I have a message from George Wells. You remember George? He killed himself in his office last month. Jonathan … did he kill himself because you were having an affair with his wife?" It's impossible not to smile when "MacGyver" is used as a verb in the first pages of How to Survive a Killer Séance. This delightfully entertaining mystery captures the ins and outs of planning a séance with helpful — and amusing — "tips" that open each chapter. (A quite practical guide is also provided as an appendix.) As a mystery, it takes a little long to get started — the séance doesn't happen until well past the 100 page mark — and the whodunit element often plays a secondary role to the setting of the story. But that's a minor quibble, as the Winchester Mystery House — a real historic building in San Jose that can be visited and toured — is an ideal backdrop, with some of its architectural oddities cleverly incorporated into the plot. Presley Parker is a terrific host for this series, which will continue its spooky themed events in the next book, How to Party with a Killer Vampire, the first chapter of which is included in this entry. Acknowledgment: Penguin Group provided a copy of How to Survive a Killer Séance for this review.